About 13-15 Days Old….Almost ready to fledge! Photo taken July 26, 2011. I took this quickly and closed the box and left. This 3-year test is completed! SUCCESS! Bluebirds fledged chicks from the 2-holer every year of the test in spite of intense House Sparrow pressure. There was no loss of bluebirds, eggs or chicks by HOSP during the 3-year test period. 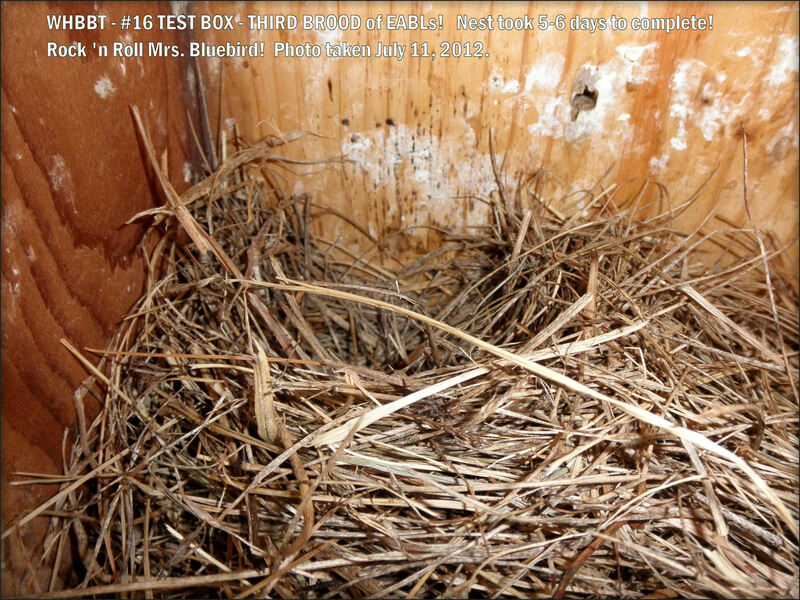 By the 3rd year of the test, bluebirds took early control of the 2-holed box and fledged three clutches of chicks. It is important to emphasize, again, that no trapping was done. 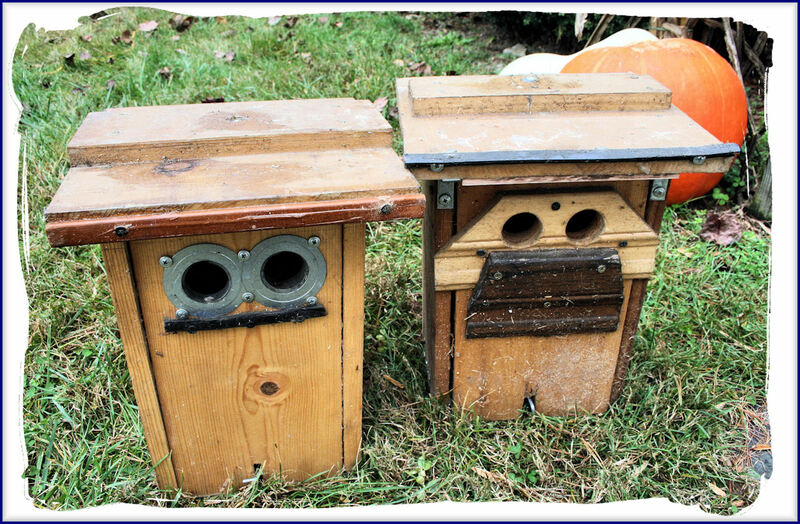 The success of this test demonstrates that bluebirds can outcompete House Sparrows if monitors provide nesting bluebirds with a correctly-designed nestbox and remove items (extra boxes and feeders) that attract House Sparrows. Christine kept online log notes of this test site, as events occurred, on her web page: Woolwine 2-Holed Test. Her information, photos and log notes are the basis of the test results presented on this test page. Test boxes are placed only at sites with active HOSP/bluebird competition because the purpose of test boxes is to document HOSP/bluebird competition in boxes with an escape hole. Monitors at test sites cannot trap HOSP, nor install any add-ons (spookers, halo) nor interfere with HOSP/bluebird competition other than to remove HOSP nests/eggs. Christine’s test box is at an in-town location where there was a history of active House Sparrow/bluebird competition in a 1-holed box prior to the installation of the 2-holed test box. The rest of her trail is rural with no HOSP problems. No other box design (to my knowledge) has undergone rigorous tests such as these where the nestbox is placed in areas with intense HOSP/Bluebird competition to document whether bluebirds can successfully defend the test nestbox with no trapping of House Sparrows and no deterrents (Magic Halos and Spookers). If you have been to this page before and read all the information below, you’ll know that this is a 3-year test starting 2010 for the purpose of seeing if the Eastern Bluebird can win the territorial wars over the non-native and non-protected House Sparrow by having an escape route (using the second hole) out of the box in case of an attack while inside the box (such as an incubating female), thus giving the bluebird more confidence to defend its territory OUTSIDE OF THE NESTBOX. I do not need to trap the House Sparrow for this test. 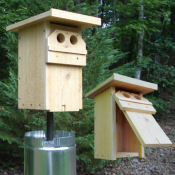 It is same installation as a standard size NABS 4×4″ nestbox–very sturdy–including stovepipe ground predator guard. No Noel guard is needed on this box since it’s a deeper box. 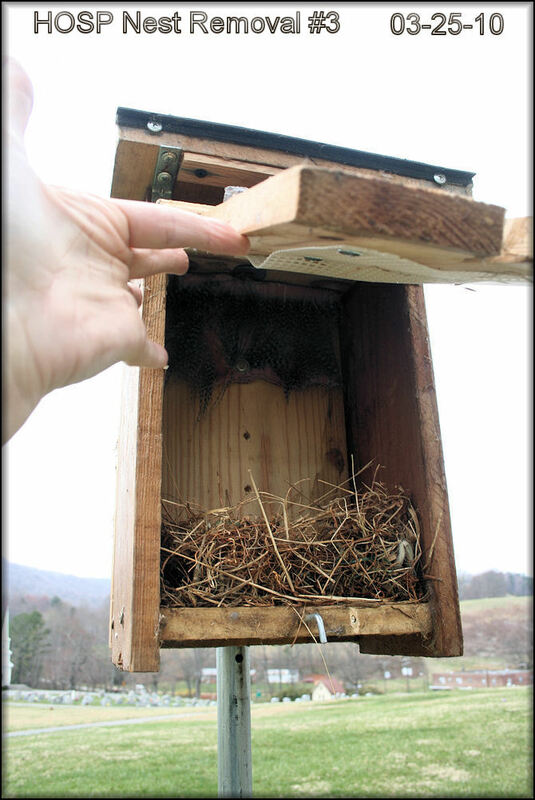 Any ground or avian predators cannot reach to a deeper box where eggs or nestlings are located. July 2012! WOO-HOO!!! There have been THREE bluebird clutches fledged in the 2-holer since the last sign of HOSP. And I didn’t have to do any trapping/killing of HOSP or use add-ons such as HOSP spookers. This was the only LOCATION on my trail that had a House Sparrow problem in which to place the 2-holed test box. Bluebirds have successfully fledged chicks in the 2-holer each year of the test without losing eggs, babies or adult bluebirds in any HOSP battle. This test box is a success! See logs of activity for 2010-2012. * The deeper box does NOT prevent ground predators from reaching in and getting things. The extra depth is effective against large AVIAN predators. And the hanger system we use out here is effective against ground predators. Even deep boxes on poles are AT RISK from ground predators. 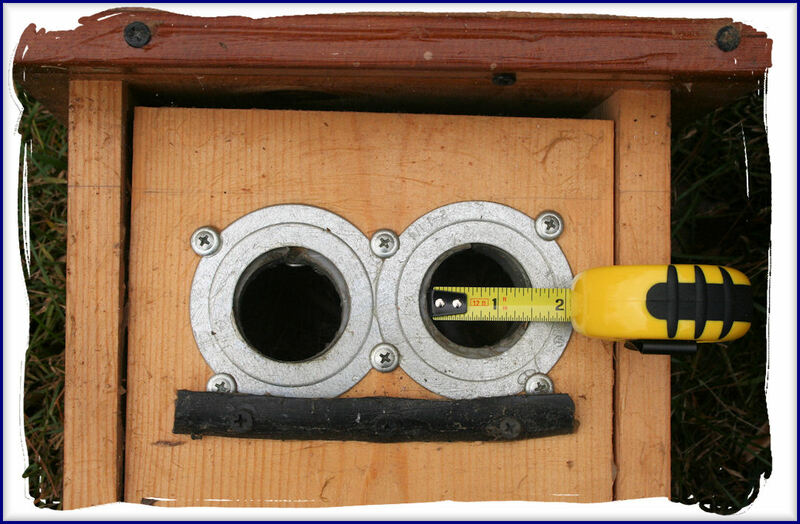 Same installation as standard NABS nestbox–on 1″ conduit with stovepipe predator guard. Generally, these two-holer “mansions” are hanging boxes high in the trees in CA for the Western Bluebird. See Linda’s website on how these boxes are monitored in CA. Linda has been keeping her page on this test site up to date, as well. Below are current results of this TEST–YEAR THREE–2012, commencing February 2012. Photo of 5 eggs were taken on April 2, 2012. See that below! 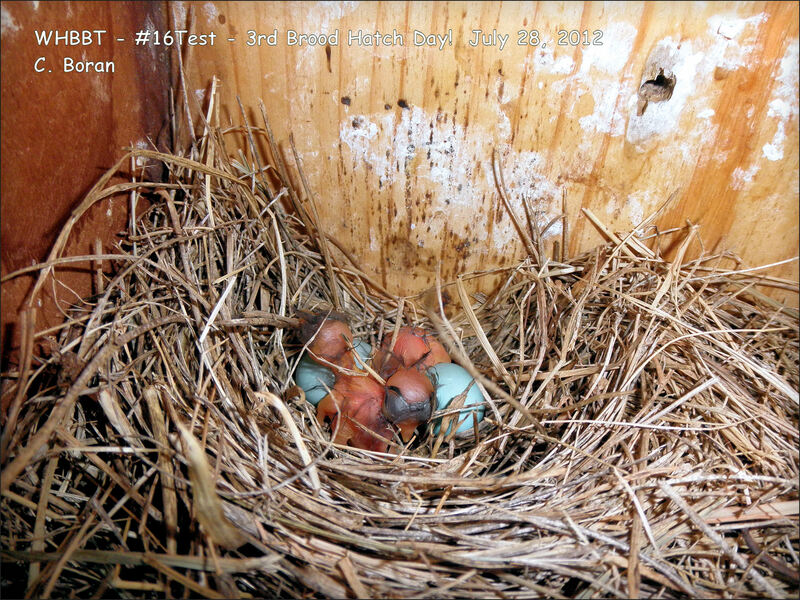 Five Eastern Bluebird eggs laid as of April 2, 2012! I was on target with estimated hatching date of April 14, 2012. Here are two-day old five bluebird hatchlings on April 16, 2012! Success! The bahies are healthy. See data on the babies for Test Season Three below. Photo taken July 11, 2012 – Third EABLs nesting this season! No House Sparrows in the TEST BOX! WOO-HOO FOR BLUE! Success once again….third brood of bluebirds hatching. This clutch of 4 eggs has two hatchlings as of 9:30 AM EDT on July 28, 2012. Woo-Hoo For Blue! TEST SEASON THREE: 2012 Results Below–Latest Date on Bottom. BOLDED DATES REPRESENTS BLUEBIRD ACTIVITY. 3/7: No activity. No HOSP activity!3/12: No activity. No HOSP activity!3/16: Soft grasses-partial nest. Species not positively IDd. 3/21: EABL IDd completed nest with cup. 3/26: EABL completed nest–no change. Witnessed male fly out of box upon my approach. 3/29: Total 3 EABL eggs. Witnessed female fly out of box. Took photo of eggs. 4/2: Total of 5 EABL eggs. Heard parents in tree above. Took photo of eggs. 4/7: 5 EABL eggs. Incubating female flew off nest. 4/10: 5 EABL eggs. Incubating female flew off nest. 4/16: 5 EABL hatchlings, 2 days old. 4/19: 5 EABL nestlings, 5 days old looking healthy. 4/24: 5 Nestlings, approximately 10 days old. 4/30: 5 EABL nestlings FLEDGED, at about 16 days old. Cleaned out nestbox. 5/12: Few grasses dropped in bottom of nestbox. Species not positively ID’d yet; looks like EABL. 5/17: Grass added. Looks like EABL. 5/26: Complete nest. 3 EABL eggs laid. Homeowner showed blue feathers by shrub. Male killed by stray cat. 5/28: 4 EABL eggs laid. First day incubation. 6/2: 4 EABL eggs. Heard female in tree. 6/8: 4 EABL eggs. Estimated hatch date of June 9. 6/9: Two EABLs hatched as of 5 PM. Heard two EABLs in tree. Female attempting to feed. 6/13: Four EABL babies alive; underveloped. Heard female EABL in tree. 6/15: Four EABL babies alive–appear slightly underdeveloped for age of 7 days old. 6/16: Four EABL babies much improved! 8 Days old but eyes on opened yet. 6/23: Four EABL babies 15 Days Old. Cracked open to see not ready to fledge yet. Look good. 6/26: EABL adults hopping and clicking noises from tree tops. Cracked box open to find four babies fledged–possibly on 17-18th day. Cleaned box. 7/07: New nesting materials dropped inside box–appears to be EABL! Heard EABLs singing in trees above. Woo-Hoo! 7/09: Added nesting materials. Heard EABLs in the trees. 7/11: EABL nest completed with cup. Heard EABLs singing loudly. 7/16: 4 EABL eggs laid. Heard EABLs in trees. 7/20: 4 EABL eggs. Parent birds in trees. Puffed Diatomaceious Earth inside nest to deter blowfly larvae. 7/23: 4 EABL eggs. Added DE to underside of nestcup area missed on 7/20 due to sudden winds. 7/27: 4 EABL eggs. Female flew off nest upon approach. 7/28: 2 EABL eggs HATCHED. 2 eggs in nest. Parent birds active watching and chattering! That is good! 8/1: 3 EABL nestlings. 1 unhatched egg. Could not remove unviable eggs. Looked small for 5 days age. Added DE. Parents in trees. 8/2: 3 EABL nestlings. Removed unhatched egg. Nestlings had some growth. Parents chattering in trees nearby. 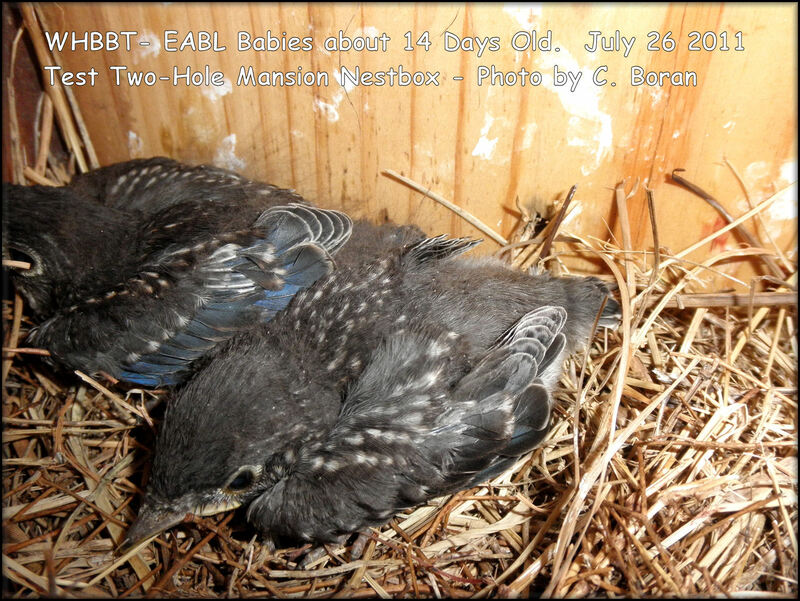 8/3: 3 EABL nestlings appear underveloped for 7 days. Used clean, unused bluebird nest and did nest switchout. 8/4: 3 EABL nestlings significant improvement in 1 day! Stronger in bones, size, feather sheaths, alertness, & hair growth. Both parents feeding. 8/5: 3 EABL — look better! 8/6: 3 EABL — more development and feathers growing. 8/7: 3 EABL — Improvement. Now 11 days old and developing well. 8/10: 3 EABL — Now 14 days old — look fantastic! Parents in trees chirping loudly. Last photos taken. 8/12: Cracked open and saw feathers and closed box and left immediately. 8/13: Cracked open and saw feathers by door and closed box and left immediately. NOTE: Homeowner called about 8:30 PM to report lots of birds flying in and out of the box and around the box and could not tell what the activity was about. She saw birds flying out of the box but could not tell if they were baby bluebirds. I went back next day at Noon to check again. 8/14: NOON: Checked and saw all 3 baby bluebirds FLEDGED. Found some House Wren sticks on the nest. That will explain all the birds flying around the box the night before. It is my summary the bluebirds had not fledged and the box was investigated (invaded?) by House Wrens which would explain the parent bluebirds defending the nestbox and young still inside the nest. CELEBRATION! THREE BROODS OF BLUEBIRDS FLEDGED THIS TWO-HOLER MANSION with NO HOUSE SPARROWS ATTEMPTING TO OCCUPY THE HOUSE– NO GADGETS AND NO TRAPPING TOOK PLACE. THE BLUEBIRDS WON THIS NESTBOX FOR 2012….NO BLUEBIRD DEATHS, adults or nestlings, EVER HAPPENED DURING THIS THREE YEARS. THIS CONCLUDES THE TEST SITE. THE HOMEOWNER HAS AGREED TO KEEP THE TWO-HOLER MANSION IN PLACE FOR FUTURE NESTINGS. Below are current test site results for the TEST–YEAR TWO breeding season 2011 commencing February 18, 2011 (chronological by date) for the two-holer bluebird “mansion” nestbox design for the larger Western Bluebird sent to me from Linda Violett in California. Remember: NO TRAPPING of HOSP are part of this test. BOLDED text below is Eastern Bluebird activity. 2/18:Partial HOSP nest. Nest removed. 3/11: Suspect Partial HOSP nest. Nest left. Will return early AM 3/12 to ID HOSP activity and will determine action. 3/16: HOSP partial nest. Saw female leave box. Also saw bluebirds in tree nearby. Removed nesting material (with hope bluebirds might try the box). 3/24: HOSP partial nest. Removed nesting material. 4/4: HOSP partial nest. Removed nesting material. 4/11: Partial nest–species not confirmed. Left nesting material. 4/19: HOSP completed nest. No eggs. Removed nesting material. 4/25: HOSP completed nest. No eggs. Removed nesting material. 5/2: HOSP completed nest. 3 HOSP eggs. Removed nest and eggs. Saw female HOSP fly out of box. 5/9: HOSP completed nest. 1 HOSP egg. Decided to let remaining eggs be laid and return later. 5/16: Same HOSP nest with 5 HOSP eggs. Removed nest and eggs. 5/24: New HOSP completed nest. 3 HOSP eggs. Removed nest and eggs. 5/31: New HOSP partial nest. Removed nesting material. 6/6: New nest started. Not able to positively ID. Left nesting material. Looked like HOSP (using hay). 6/13: Previous nest material from 6/6 covered with one-inch of sticks-looks like the House Wren. Left as is. 6/20: ID’d as Eastern Bluebird nest–finer dried grasses. Will check again! 6/27: Positively ID’d as bluebirds. Nest built high–new cup and first bluebird egg laid TODAY! 7/2: 3 bluebird eggs laid. 7/5: 3 bluebird eggs. Removed HOWR sticks on bottom. Treated nest with organic DE to control blowfly larvae. 7/13: 3 bluebird hatchlings! Look to be about 2 days old. 7/18: 3 bluebird nestlings doing well–look about 7-9 days old in development. 7/26: 2 bluebird nestlings 13-14 days old–perhaps one prematurely fledged? See top of this page for photo. 7/29: 3 baby bluebirds fledged. Parent swooped at me (for empty nest?). A few small House Wren sticks on top. 7/25: Day 20: Upon check at 7 PM, all bluebird babies had fledged. They could have either fledged 7/24 in the PM after I left or 7/25 sometime during the day–either Day 18 or Day 19. In spite of applying DE to this nest before the eggs hatched, I found some some live blowfly larvae on the underside of nest along with some dead ones. This could have caused the delay in development of the nestlings in addition to the heat we had here. Perhaps I did not apply enough DE to this nest, since the nest is larger because of the larger floor size. The good news is they made it out of the box. 7:24: Day 19: At 11 AM, bluebird young not fledged yet and saw female entering box with more food and sit on top of the box. Not sure if some young started to fledge and some still in box. 7/20: Great news! 14-day old nestlings looking healthy, developed as should be for age, and ready to fledge…possibly in 2-3 days (my prediction). Saw both parents fly in and out of the box with food several times while watching for 20 minutes, heard multiple nestlings cheeping. I was able to peek in quickly by cracking open the box and saw one chick standing alert-had spotted feathers! Parents did enter box and together feeding the nestlings–another great reason to have a larger sized floor (room for chicks and both parents). My theory why the nestlings were slow to develop: the nestlings were heat-stressed for about a week and too weak to take in food (?) but caught up in development later as they assumed growth and strength. The DE applied before hatching was beneficial to alleviate blowfly infestation! Time: 10:30 AM, 82 degrees and breezy. Box completely shaded by trees in AM. 7/13: 3 nestlings–Underdeveloped and weak at 8 days old. Saw female enter box to feed. Reason of health issue with nestlings undetermined. 7/11: 3 hatchlings (5-6 days old and looking underdeveloped–reason unknown at this point). 1 egg status unknown/not seen–possibly infertile egg removed by female or buried in nest. Due to rain, will check them on 7/13, weather permitting. 7/6: 1 EABL new hatchling. 3 eggs remaining. 7/5: 4 EABL eggs-saw female fly off nest. Hatching due July 6th or 7th. 6/29: 4 EABL eggs-saw female fly off nest-photos taken. Treated nest with DE for blowflies. 6/24: 4 EABL eggs. Female started incubating on 6/23. All is well! 6/22: NEWS! 3 laid EABL eggs! Saw female foraging for food nearby! 6/19: Appears to be perfect EABL clean grass nest–cup ready for eggs! 6/12: Partial HOSP nest materials found. Nest materials removed. 6/6: Box empty. Another torn piece of purple cloth on ground at pole. 6/3: Box empty. Property owner saw EABL male & “brown” bird on nestbox roof multiple times (not sure if HOSP or HOWR yet–we are also in wren territory). I returned later PM with binocs to do surveillance of the box. No sighting of either species by me then. Will check again on weekend for any activity. 6/1: Box empty. NO nest material in box except piece of purple cloth on ground by pole–no sign of HOSP at box check. 5/29: Completed HOSP nest with 3 eggs. Removed nest and eggs. 5/21: Partial HOSP nest built-no eggs. Saw male HOSP fly out of box. Nest removed. 5/14: Completed HOSP nest. 1 HOSP egg on floor below nest. Nest/egg removed. 5/6: Completed HOSP nest with 2 eggs laid. Nest and eggs removed. 4/28: 1-day old HOSP nest removed. Saw female fly out. Photo below. 4/27: Partial HOSP nest built. Nest removed (huge nest with trash). 4/22: Partial HOSP nest built. Nest removed. 4/15: Partial HOSP nest built. Nest removed. 4/11: Nest checked onpositively ID’d as HOSP. Saw female HOSP. Nest removed. 4/8: Nest not positively ID’d if HOSP or EABL. Left nest. 4/1: Partial HOSP nest built. Nest removed. 3/24: Partial HOSP nest built. Nest removed. 3/17: Partial HOSP nest built. Nest removed. HOSP pair sighted on box. 3/10: Partial HOSP nest built. Nest removed. So far, I’m finding House Sparrow nests weekly in this box, as expected, as part of this test. The HOSP nests are removed and no trapping will take place. We will see now if the bluebirds can attain final occupation of nesting in this box by winning the competition for the territory. At least 2 acres of forage space is necessary. Please read this page on the test for more information on this 3-year test between the Eastern Bluebirds and the House Sparrows. Male HOSP. See how strong his beak is–uses to crack corn and seed and millet and for attacking other birds by pecking them to death. PLEASE DO NOT FEED CHEAP MIXED SEED and use SAFFLOWER OR SUNFLOWER SEEDS to attrack our songbirds. Mixed seed attracks the House Sparrow. I tell anyone who has a bluebird nestbox NOT to attract the House Sparrow by using mixed seed. I use ONLY black oil sunflower seeds in my yard. Female House Sparrow–the bird people have difficulty identifying. The male HOSP bonds to a nestbox, not a mate. If she fails to reproduce successfully, the male HOSP will find another mate who will! The male bluebird, on the other hand, tends to bond to a mate and not a nestbox. If the female bluebird has trouble with one nestbox, he’ll search out another nesting location for her. WE MUST NOT ALLOW THE NON-NATIVE HOUSE SPARROW TO USE NESTBOXES DESIGNED FOR NATIVE CAVITY NESTERS. 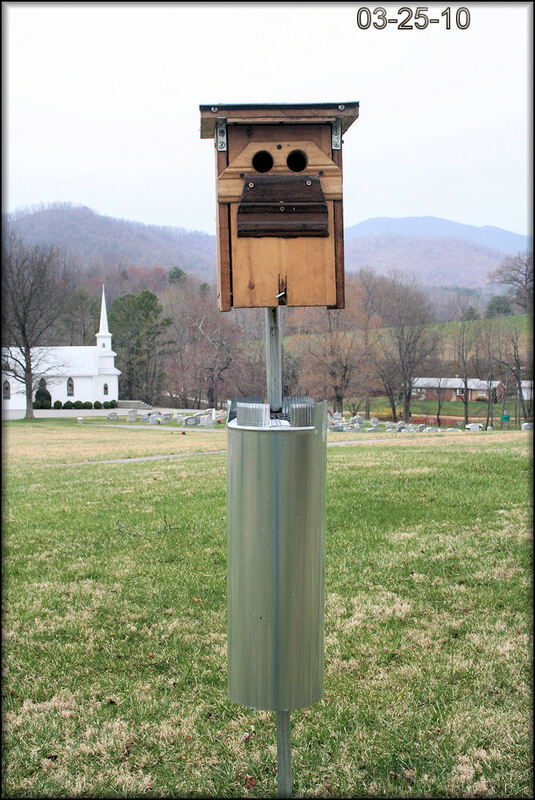 Here is another photo of this “two-hole mansion” nestbox’s installation on back side of pole. See additional notes above. These guys are persistent. Above is only one-day’s work. I decided to remove it since I was standing there anyway taking this photo. I saw the female fly out of this box when I approached it. This is the nest positively ID’d on April 11 and removed. You are looking at the front side as it looked when opening the front-opening box. You can see the tunnel has begun, as you see the straw starting to be built up on the back side of the nest. When I approached the box, the female was inside the box for about 20 minutes before I opened it and saw her fly out of it as I approached. Also mixed in the nest and not easily seen here were pieces of fabric, cellophane, and Cardinal feathers. If you look closely on the left side, you can see part of one of the small feathers. Note: This Test Box was installed at the beginning of March 2010. What is this two-hole test all about? Read on! This bluebird breeding season commences with installation of a test box (pictures below). I have agreed to test one 2-hole nestbox “mansion” made by Linda Violett in Yorba Linda, CA, for her Western Bluebirds. Maybe the tragedies we hear about our bluebirds getting attacked by the House Sparrow inside a nestbox does not have to happen. Can the bluebird save himself without too much human intervention by escaping those attacks and keeping dominant over his nest site of choice? That’s what this test is about. These holes are a “smidge” slightly larger than the standard size entry hole. Starlings and larger birds should not be able to have access. This is the TEST BOX I will use: Again, standard Eastern Bluebird hole size. Hi…sorry for the delay in responding. I have done several posts on this topic on this website. Here is one I did in 2010. It includes a site where I found the food grade DE (actually pretty easy to find if you Google or similar search on the Internet with the keywoods “Food Grade Diatomaceous Earth”. Anyway, read the 2010 post and see the hyperlink included. I can come back and do a follow-up reply with other sites, if you like. I only ordered a 2 lb. bag to use for my nestboxes. When applied carefully and correctly, it becomes a pretty easy process with practice. See here: https://woolwinehousebluebirdtrail.com/2010/04/30/my-plan-combating-the-blowfly-problem-for-2010/ Just so you know, I’m introducing the hardware cloth risers in the bases of some of my nestboxes to experiment using those to put more air circulation at the bases of the nests and using without DE to see if they actually are productive in blowfly larvae deterrence. I’m getting different stories that they do work or do not work. Knowing how the larvae survive inside a nest, I’m not 100% convinced yet, but that is why I like to experiment with different methods on my trail of 34 nesting boxes. I also have a Microsoft Word document (two pages) of a detailed version with pictures how I actually do the DE applications. In my earlier years of bluebirding, I had several losses of nestlings to death due to a huge infestation of larvae. I just could not take that anymore and decided to use the DE method that Mr. Harry Schmeider recommended in a presentation he made in 2009 at the North American Bluebird Society’s annual conference, which was held in PA. He did a great presentation titled “The Fledging Experience” and he mentioned the use of DE on his bluebird trail and success using it. If you want read more about Harry and what he does with DE, here is his section on the use of DE for blowfly larvae control in bluebird nests, just go to his website (I am unable to link the full page) but find the article this way: Go to his main page, click on Let’s Talk Bluebirds, and then look on the right sidebar and look for Blowfly, and you should find a great writeup there: http://www.ambassadorforthebluebirds.com/ If you want my Word document, you’ll need to respond and let me know if you want me to Email it to you. Your Email address remains private on this site (only I can see it, not the public), so let me know what Email address to send it to you. Once I see it, I’ll write it down and delete your note from my website so it won’t go public. Would you please send the word doc about DE to me? Yes, I will be emailing it to you sometime today. I’d advise investing in a sparrowtraps.net sparrow trap. It aids the bluebirds a lot more when you eradicate the local sparrows rather than deterring them. I purchased two in April and have caught over 60 sparrows. Bet at sialis.org recommended them to me and they work! Appeasement and deterring does not. HOSP numbers will only increase without elimination. Hi, Bill, thanks for the sparrow trap info. Actually, I’m very well aware of trapping. Please go back and read all the detail on the Two-Holer Test Site page. The purpose of the test is to see if the bluebirds can indeed maintain territorial rights to a nestbox by being able to do so OUTSIDE of a box (able to defend themselves from attack) as opposed to being trapped inside a one-hole standard size nestbox and getting killed by a sparrow. 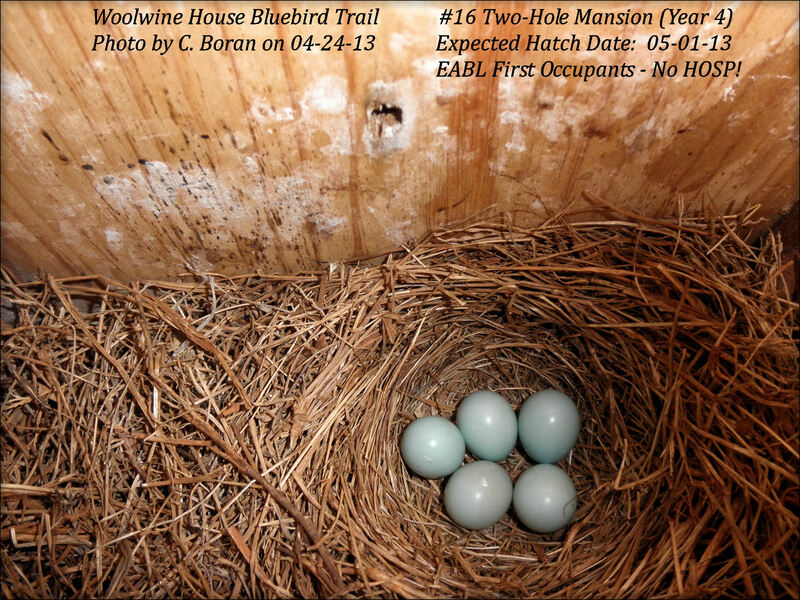 The two-hole mansion test box came from CA and normally used for the Western Bluebird. These two-hole boxes are being tested elsewhere in the U.S. as well. You should visit Violett’s Bluebirds website and read about it. My test started this year, 2010 nesting season. The test site requires I DO NOT TRAP for the test results (3 years) to be completed. This is the ONLY site along my trail I have the House Sparrows. Also it’s important that I mention I cannot trap at this location since it’s a private residence, and I cannot consistently be available to handle trapped sparrows at this location. This makes the two-hole test nestbox a good location because of that reason. I know Bet Z and the Sialis.org site well. Thanks for your note. I would love to hear from you again! you DO have a great web site. Thanks for the great work you do with BB and also with your site. It’s very educating and nice to return to, from time to time to see your updates. The two- hole version caught my attention, especially since I only do have a few boxes out there and some of them are attracting Tree Swallows. I tried to experiment with a Kinney- box for TRES, but the birds obviously do not like the multiple hole approach. So I turned to 6.5 x 6.5 inches square minimum floor- size plus two entrance holes. This is when I ‘stumbled’ into your web- site. I do know that most BB boxes are too small for TRES but yet are occupied by them. I wonder if the two- hole idea is not bad, at all. Thank you for the note here, Rainer. The test two-holer probably will work for any cavity-nester. You have a very good point about the Tree Swallows. We have Tree Swallows in the area of the test site, but only the House Sparrows are winning over that box at the moment. The TRES don’t seem interested…assuming because the HOSP have taken over the box. The test is to see if the bluebirds can win over the box since they have more of a chance to win the box as long as they are not attacked and killed inside the box (escape hole). We’ll see. This is the first year of a 3-year test. I hope you visit Linda’s page to see her setups with the two-hole mansions for the Western Bluebird.